Pre-Race. The weather was as forecasted, 30 degrees and snow showers, but somehow when you emerge from your lodging in the dim light of 6:15 am and see your car covered with an inch of snow, it hits home--Yikes!--One more day of clearing snow off the windshield--and then running a 10 Mile Race--hmmm. It's a good thing I was prepared. I had even stopped at a Salvation Army store the day before and picked up a cheap but warm hooded sweat shirt to wear for the lead-up to the race. I can keep my warmth until a minute to go when I can discard it to the side; Race staff will typically pick those up and donate to a local homeless shelter so it works well all round. I had also decided to wear racing mitts after going bare-knuckled in my previous 3 freezing runs over the last 5 months. I'd had enough of hands feeling like 'meat hooks' at the end of the race. 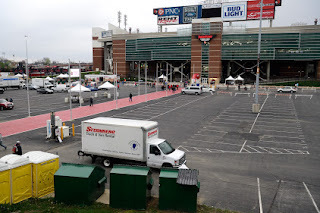 The race starts near Papa John's Cardinal Football stadium at the University of Louisville and finishes right outside the stadium. That makes for easy and plentiful parking about a half mile from the start. Warm-up went well and I stepped to the line feeling confident; the weather was not great but it could be worse. It did not appear the roads would be slick and the snow showers and cloud cover meant hydration was not much of an issue. At that point a friendly local runner in the 65-69 division engaged me in conversation. When he learned my age he generously told me who my main local competition would be. But as I am from Indianapolis, I do not know the locals. I thanked him nonetheless. Amazing how friendly and helpful runners are to each other! Time to line up for the start--But I made a 'rookie mistake', forgetting to get my watch set for the start, and then the horn went off and it was too late. The first 3 miles are relatively flat and then we are at the Iroqouis Park entry and get a quick little step up into the park. After a bit of flat followed by a gradual slight uphill we hit the first real hill and it is here I start to feel my lack of long distance pace conditioning. Around a couple of bends and there is the 4 mile clock which reads 35:30--What?! Now I am convinced that at least this clock is in the wrong spot, a fear confirmed when the clock at 5 miles reads 40:57. 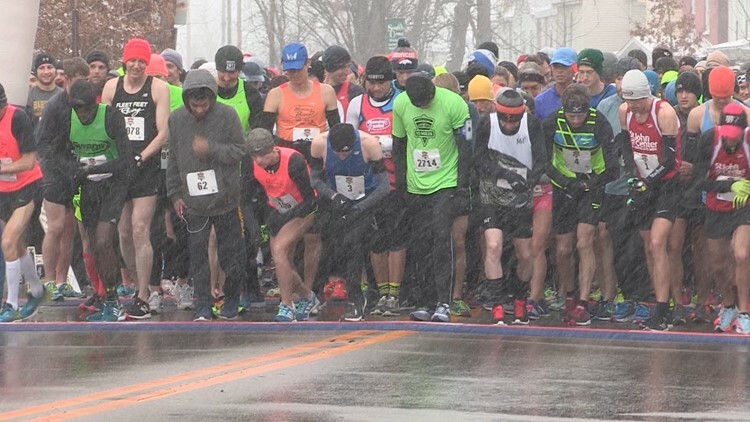 There is no way I am throwing in a 5:27 mile in the middle of a 10 Mile race even if there was a pretty generous downhill in that portion; there was also a modest uphill! So now I start to doubt all of the clocks. And, of course hope that this clock at 5 miles that shows me now over 8 minutes per mile pace is not accurate---or I will have to finish pretty strong! Of course I know that the last 3.5 miles is almost all flat or slightly downhill until a final overpass with about a half mile to go so a strong finish is not out of the question. To be frank, the clocks I saw at 6 and 7 miles and the finish line did tell a consistent story with mile 5 at least. Shortly after we passed mile 5 we had a downhill and then the last long, winding uphill. Once we crested that it would be all down or flat until the final overpass, a comforting thought. Unfortunately the clock at 6 miles, after we had begun the descent out of the park showed that last uphill had me losing more time to the 8 minute pace I desperately wanted to beat. Oh well--I would just have to hope I could finish strong. 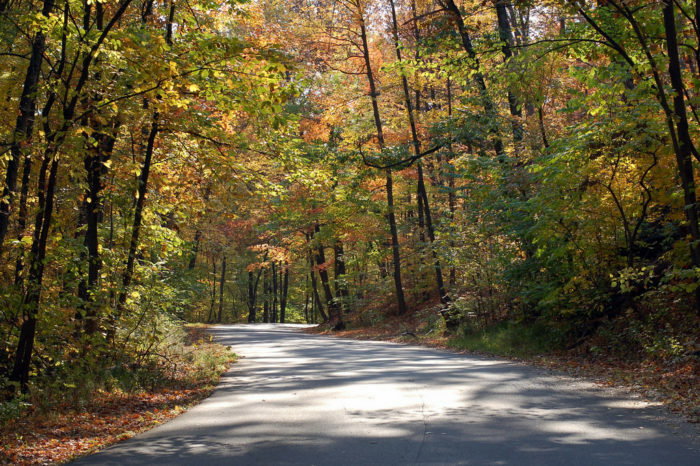 But then heading toward the 7 mile mark, I felt a pain I had been worrying about in the back of my mind. It was not the left hamstring issue I have been struggling with for the past couple of years; it was a sharp, shooting pain between the shin and the ankle on my right leg. I had had a few minor incidents previously. At the Orange County Half Marathon last May where I won the National 70-74 Championship, I was almost brought up short just 400 meters from the finish line with the same sharp pain. Then I altered my stride a bit and after about 50-60 meters, the pain went away and I finished fine. At the 15K National Championship in Tulsa last October I had a similar problem except it hit shortly after we passed the 10K mark and lasted longer, perhaps the better part of a mile. Again after altering my stride I was eventually able to run out of it; the problem weighed on my mind but did not prevent me from finishing well. It is a bit scary because it is a very sharp pain when you land on the right foot; it makes you want to stop immediately to avoid further injury. But of course I do not want to stop, so I try to find a gait that will let me continue. I tried that in this race but was, in general, less successful than in the recent past. It was off and on for at least two miles and I needed to try some pretty extreme inefficient strides to keep the pain away, but it would only last for a few hundred meters at most and then the pain would be back, sometimes very bad sometimes not so very bad. A couple of times I was within a stride of giving up and walking, but I always found a gait that would 'work' just before that. So it was a rather slow miles 8 and 9 with occasional spurts where I could increase my turnover without pain although, as noted, that never lasted more than a couple of hundred meters at a time, when the shooting pain came back. I tried to focus on getting the left leg to grab more territory and have a better turnover as I suspect this ankle/shin problem is partly due to asymmetry of stride acquired during the long months of the left hamstring issue. But I could not keep it up. At times I would run with a very slow and awkward stride to avoid the pain. Eventually I got past mile 8 and then past mile 9 and then I could see the turn for the overpass--less than a mile to go! At that point I heard another set of words I would worry about for an overpass--Helpful spectators were calling out: "Watch out runners; there is ice on the overpass!" I figured at least the shin/ankle problem would go away running uphill, which it did and luckily the ice did not prove too problematic, although the surface was definitely slippery, and required a careful stride up over the top. I worried about the downside of the overpass but there was no ice on that side and I again tried picking up the pace on the down slope, although worried about my other problem. But that stayed in remission until I rounded the corner and was back on the flat. Then it flared up again briefly for about 20 meters but I was able to accelerate out of it and continue at a fairly good clip into the Finish Line--What a relief! My time was 1:22:04, not at all what I was hoping for. I had assumed I would run a 1:18 or better and had dreams of 1:16 or maybe even 1:15. And, to be frank, event though this leg problem definitely slowed me down it is hard to think it made much more than a couple of minutes difference. So I got the win and the $50 Papa John's gift certificate that goes to the Age Division winner--Hurrah--Time to smell the pizza! The Race: The Papa John's Pizza 10 Mile Run is a well organized race. The course is challenging but fair. If you are looking to run a record or a PR it is certainly not guaranteed by the course; you will have to earn it. It is essentially out and back so should be record eligible. But it is not usatf certified so if you want to set an American Record, it is best to pick another course. Several people announced on the PA System that this was the first Ten Miler with snow. So weather is typically warmer. The only problem I noticed was the inaccurate placing of perhaps two of the digital clocks. The 3 mile clock was probably a little too close, perhaps 100 to 150 meters, to the start and the 4 mile clock was definitely too far away, off by as much as a quarter mile. The rest told a consistent story. Personal: It is a great privilege to be healthy and running road races at the age of 72. I am very grateful. Because I participate in National Championships, I also know how tough it is to be competitive at that level. If I am registering disappointment, it is in knowing how much farther I have to go to be competitive again and, to be frank, the worry about the shin/ankle problem. * But a win is always great, especially so when one encounters issues during the race! * A week after the race, my Physical Therapy guy tells me I am overworking my anterior tibialis on my right leg. He has prescribed some exercises which will reduce the likelihood of future occurrences. But it is partly related to the asymmetry between right and left legs which came in while rehabbing the left hamstring. Part of the correction is to focus more on symmetry in training and races and make sure that the left leg is doing its full share, especially on downhills. The good news is that it is not structural but muscular and hence subject to correction with a combination of massage, exercise, and running gait/posture/L-R symmetry.